We’re counting down the days to the weekend. As one final hurrah before we become a family of four, we’re headed down to DC for a few days to relax, spend time with some family there, and meet up with the Underwoods. And we’re going to drive an actual car!! I think we’re almost as excited about that as the trip itself. I’ll document our adventures over the weekend here, if you want to follow along. With our mini-getaway planned, we thought March would be a good month to tackle the vacation portion of budgeting. We also wanted to talk about it before the big vacation months hit in the next few months. Vacations are interesting because they’re not a necessity per se, and yet they’re very necessary. We’d all lose our brains without them. And while they only occur once or a few times a year, they have the power to take all your hard budgeting work and put it on the next flight to Tokyo. Or Hawaii. Your choice. They’re one of the biggest areas of our budget, second only to rent/mortgage and food. But for some reason, they’re often not included in our budgets. They’re just this huge splurge we justify. And then we come home refreshed and a little sunburned, having to pick up the pieces of our wrecked budget. We’re hoping this post can help rectify that trend, while also encouraging responsible vacationing. So consider this post our very own PSA: Don’t Vacation Irresponsibly. And here are our tips for how. This. Johnny and I only started doing this a couple of years ago, and it’s been a game changer for our budget. Before, we weren’t accounting for vacations in our monthly budget, which meant our projected spending for the year was totally incomplete. Now, when we plan our yearly budget at the beginning of the year, we include everything — vacations, gifts, Sally clothing growth spurts, etc. It’s nice to plan in advance how much money we can spend on vacations because when it comes time to actually booking a trip, we’re prepared for it. It’s guilt-free, and we’re not asking ourselves, Can we afford this?? “In advance” doesn’t mean the weekend before, although I do really miss those last-minute college road trips. We try to plan for each trip at the same time we set our vacation budget — at the beginning of the year. We don’t actually book anything, but we go ahead and tentatively decide all our trips for the year. This year, we’ve given ourselves five weekend getaways, as well as two bigger trips. When we actually take them is TBD. We’ve also budgeted how much we’d like to spend on each one. By planning our trips at the same time as our vacation budget, we’re more likely to stay within the spending parameters we’ve set. This rule of thumb mostly applies if you’re on a tight budget. Johnny and I kept our vacation spending in check while we were paying off our debt by following this rule. This is how it works: whatever money we’d make in paid time off became our budget for our upcoming vacation. This included lodging, food, and transportation. It kept our vacations thrifty, but it was our only way to take a vacation while our budget was so tight. And it helped incentivize us to scour the Internet for deals and to maximize any airline or hotel rewards from our credit cards. Which brings us here. DEALS. I swear a vacation is that much more satisfying when you find a deal. Luckily, deals can be found all over the webisphere these days. In this post, Johnny outlines the method to his madness in finding Priceline deals on hotels — one of the many reasons I love him. Deal sites like Travelzoo are another great way to keep an eye on good prices. Although, a friend introduced me to their email newsletter recently, and it’s kind of torturous seeing all the cheap places I can’t fly whilst 35 weeks pregnant. Would you believe me if I said I can’t remember the last time we paid for an airline ticket? 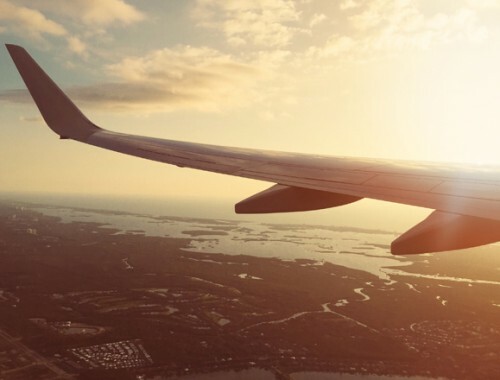 We’re all about maximizing our credit card rewards, and our main focus is airlines. We put almost all of our spending on our Chase Southwest cards. And we signed up when they were running a crazy promotion for the cards, which means we’ve been flying free for years now. If we can get the airline ticket paid for, our vacation is suddenly a fraction of the cost. Credit cards take turns running different promotions, so if you have a preferred airline or hotel, keep an eye on its credit card for a good time to sign up. The whole point of a vacation is relaxation. And while you may still have to worry about whether your toddler just ate a handful of sand, you shouldn’t have to stress over money on your trip. Set your budget for each vacation, and then don’t think about money again. Plan in advance what you can splurge on so it isn’t a choice while you’re supposed to be relaxing. That airbrushed Spring Break ’15 tee you’ve been pining for? Know in advance whether you have the extra money for such a timeless souvenir. And then sit back, grab a piña colada, and think about nothing at all. 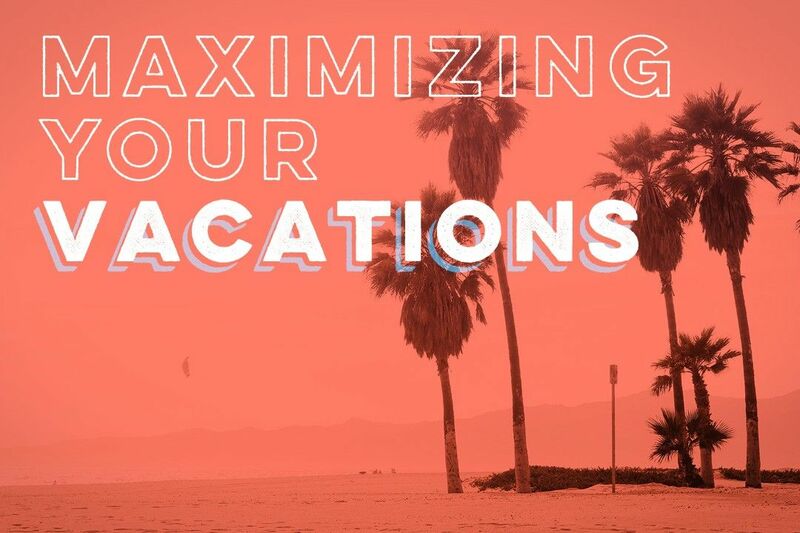 Those are our tips for maximizing your vacation budget. I hope we’re able to put a few of them into practice this year… we’ll see just how much baby #2 rocks our world. And now we want to hear your tips. How do you maximize your vacation spending? What tips would you add? Any toddler-friendly DC attractions we should know about for this weekend? All of these are such great tips. We do a lot of research on Tripadvisor beforehand, and my husband has introduced me to waiting to make some plans on what we do once we arrive at our destination by asking locals and other visitors. We’ve found some very cheap, hidden gems this way. Oh yeah! I should have mentioned TripAdvisor… we’re the same way. And great idea on asking locals once you get into town… we’ll have to try that next time. I second Brittany’s thoughts about TripAdvisor. I usually do some crazy research and love staying at smaller hidden gems. For our honeymoon we went to Nicaragua and stayed in this woman’s guest house off of Air B&B. It was incredibly cheap and put us right where we wanted to be. Our hostess was amazing and I never would’ve found this place without the glowing internet reviews. We’re planning a trip to Italy in the fall and I’m hoping to find some more spots like that! Awesome! Sounds like you found a steal. We love TripAdvisor, too. I just forgot to mention it. We use it every time we travel! Great tips! I think planning for vacations is so important, and I love the way you set it as a rollover category in your budget! I don’t plan out every year what vacations I’ll take and budget accordingly, because I never really know what’s coming. I also don’t take huge vacations very often. We tend to do little weekend trips here and there if we need a break. But I set aside money every month in my “planned spending” account so that if that day comes, I’ve got enough. We’re headed to Europe in April, which was something I definitely did not plan on, but I’ve got enough money in there now to cover the trip, so I’m not stressing about it. That’s a great way to save for vacations. We have some friends who do it the same way, and it seems to work really well for them. Very cool that you had your Europe vacation money set aside already! Enjoy your trip! Awesome tips! We needed a few days away from our hectic lives a few weeks ago and I was surprised for the first time ever I had set aside money for the actual trip. It made the trip that much more relaxing knowing that I wasn’t going back to work to pay for something and be even more stressed! We are bad planners so one thing we are trying to do is come up with vacation ideas ahead of time and not spur of the moment! Seriously. There’s nothing worse than stressing about money on a trip. It can be hard to plan vacations in advance, but just having that money set aside is what’s most important! I never heard of the spend what you’d make in PTO rule before, which seems like a pretty handy guideline. I’m excited to see how your trip to DC goes, we’re going for an extended weekend in April for our anniversary. You’ll love being in DC! It will be so much warmer than when we went so you’ll enjoy the sights a bit more. Maybe the cherry blossoms will be out when you guys get there! Airfare-wise, studies show that Sundays are the best days to purchase tickets (an average savings of $60 per ticket!) and Tuesdays (fewer people fly on Tuesdays… less demand can = better deal!) are the days that usually have the cheapest flights! So buy on Sundays and travel on Tuesdays to save some $$. What a great tip! I’ve always wondered about that. Thanks for sharing! That really does help cut down on costs. We’re hoping to do that this summer since our “vacation” will mostly just be a trip with a baby and toddler! I like the point about budgeting for the vacation and then relaxing and not thinking about money while you are away. If you can’t afford to go on vacation, or aren’t willing to spend any money on it, don’t do it! Take some time off work and do fun things in your hometown. My parents, who pride themselves on their frugality, used to take us kids on truly dreadful family “vacations.” We would have to sleep in the van (or at the homes of obviously imposed-upon relatives) and eat increasingly stale peanut butter sandwiches. We could only go and do things with free admission. Really, it would have been so much more fun to stay home. And I am sure the relatives would have preferred it. Yes. You make really good points. Stay-cations are underrated. 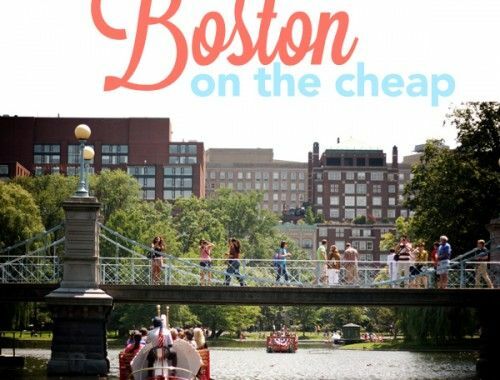 If the money’s not there to travel, you can still have a great time around town. And those sound like some pretty memorable family vacations… oh dear! It pays to do research when it comes to vacations. You’ll find a lot of tips to save money on your trip: where to stay, dining places, what specific sights to see, etc. It’s a good idea to start planning and booking for your vacation as early as possible, especially if your going out of town or out of the country. Yep, research is key. Even though it can be time consuming, it’s worth every second! This is perfect timing! I’m dying to go on a vacation somewhere warm and tropical (I’m sure the ice on my car this morning has nothing to do with that). This is the first year I’ve built into my budget some vacation spending- money for plane tickets, mostly. So I’m super excited to not be so stressed about that. My biggest vacation tip is to sign up for Groupon/Living Social deal emails for whatever city you’re going to a few months in advance. 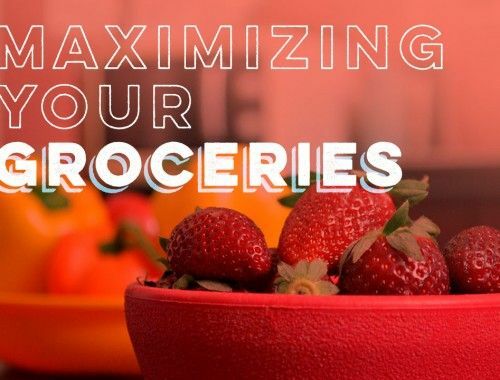 It’s a great way to save a few bucks on meals and activities, but it will also probably show you a lot of cool activities that you wouldn’t know about otherwise. Oh, great tip! I wouldn’t have ever thought about that. We’ll have to give that a try, too. Thanks for sharing! Thanks to you guys, I for the first time set a yearly travel budget for myself. Whether I will actually stay within it through 2015, well, that remains to be seen. I LOVE traveling. AND I already spent half my budget on a trip my mother and I took to Aruba in February for my 30th birthday! But in some ways I think of this year as also a lesson to learn how much I actually need to set aside in this yearly budget category since I’ve never paid attention before. Time will tell! Sounds like a trip worth spending half your vacation budget on! The big 3-0 is worth celebrating. And way to go on setting a yearly travel budget… even if it’s not perfect this year, just setting it will keep your spending lower than it otherwise would have been!